“First in class” was a 2010–11 campaign of half page colour ads in a glossy Trans-Tasman Classic Car magazine for Auto Restorations. The campaign theme dedicates a series of half-page full colour ads to celebrate their 16 international award winning restorations individually. These prestigious milestones on the world Concours d’Elegance stage are little known facts and a newsworthy story to get the attention of their audience. Each ad features a hero shot of an award winner from different design periods and by different nationalities of maker. This demonstrates the breadth and the depth of their expertise in restoring fine old cars. The design theme and typographic style of each ad is tuned to the era and character of the award winning classic automobile. All aim to create the ideal platform in the magazine for the envious beauty of the cars and high standard of Auto Restorations’ work to speak for itself. The ads have short copy with a story to tell—a welcome break from the information overload of most small advertisements in the magazine, and giving a visual break from the text heavy editorial around them. All are designed to interest the reader, grab their attention, and be memorable. As the saying goes, you’ll never bore someone into reading your ad, but you might just interest them! This pair of ads features two cars, each of which is considered an automotive design triumph; the exquisite and rare 1955 Siata 208 CS Balbo Coupé, (only 9 were constructed by Balbo), and the Talbot Lago T26 GS Coupé of which only 30 were made by French carrossier Franay. The 2012 quarter page horizontal newsprint campaign of small ads ran in Petrolhead Magazine, a monthly giveaway at motor trade outlets nationwide. The campaign launched Auto Restorations new ‘Auto Restorations American‘ sub brand. This was an initiative of the General Manager to address the growth/change in the nature of their auto-enthusiast customers in New Zealand and Australia where an increasing proportion of Baby-Boomers are American and Australian muscle-car enthusiasts rather than the early to mid 20th century Classics of Europe. The print campaign paired with the web launch of an ‘American Muscle’ department on the site repositioned the perception of the firm among the local market of car enthusiasts. Co-ordinated with the launch of the new sub-brand in Petrolhead I also created a new ‘Muscle Cars’ department on the website. The advertising theme had the mandatory inclusion that the ads must feature American cars that Auto Restorations have fully restored, or refinished, as with the green Shelby Cobra. This also goes for the ‘American’ logo which features a “high velocity, high volume” 1968 Shelby Mustang GT 350 . The ‘new breed’ of ad concept I ran with was inspired by the American musclecars, an attempt to pony-up the large type, punchy headlines with the grunty images. The “BORN TO RUN” headline might appear over-stated until you read the bio of the 1949 Baldwin Mercury Special. The ‘American!’ variation of the brand ran in the launch “Historic Finish” Shelby Cobra advert. The readers of Petrolhead magazine were surprised to see ‘Auto Restorations American’ appear in Petrolhead, as the firm had been pigeonholed by many as interested in working as a specialist Classics only restorer. The ads succeeded in overturning that myth, proving that when you launch something you’re best to give it all you’ve got! The classic mahogany ‘Criscraft’ speedboat being towed by the 1948 Packard Woody is a photocomposite. 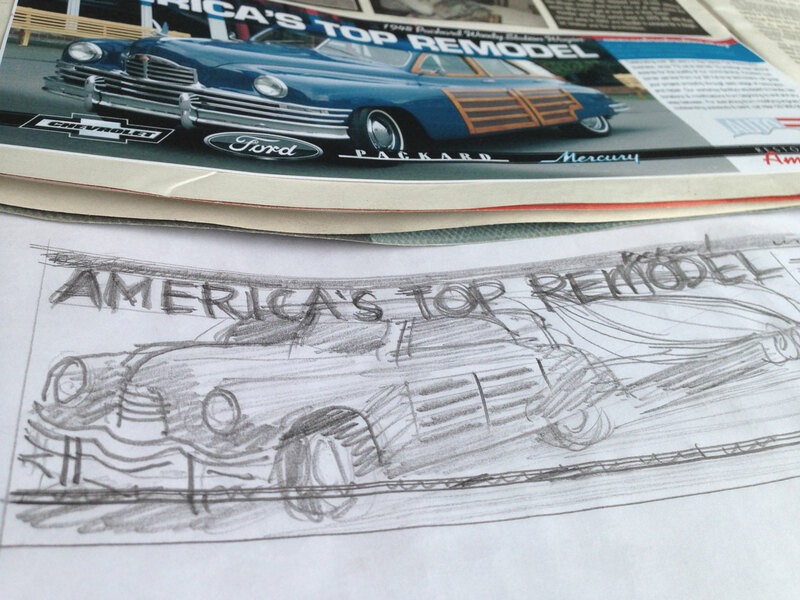 The Packard Remod’ draft and concept sketch of the final photocomposite.